If you're new here, hi! Here's how this works: Each month we read, discuss and obsess over a new book; so if you haven’t signed up already, be sure to CLICK THIS LINK and officially join the club. We’ll email you with Chloe’s Book Club updates, reading guides, special contests and giveaways, event invitations and more. 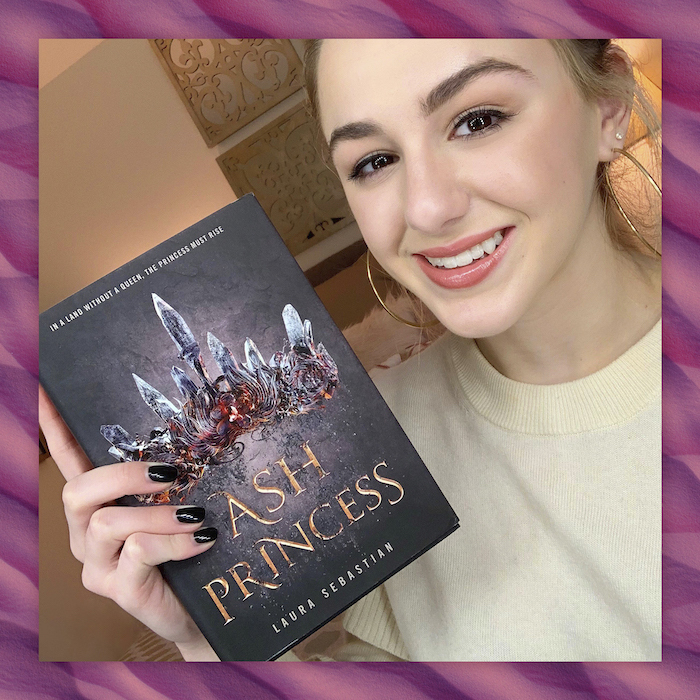 The thrilling February edition of Chloe’s Book Club stars Ash Princess by Laura Sebastian, an action-packed, feminist fantasy about the power of fighting for what's right. 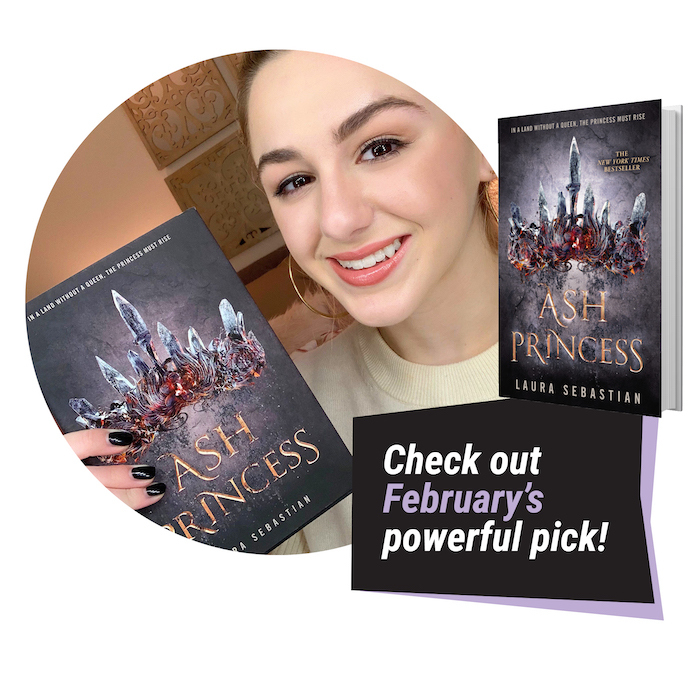 To get 15% off your copy, head over to Barnes & Noble and use the code chloereads at checkout (offer available through February 28, 2019). Or, if you're shopping in store, CLICK HERE to snag a coupon. Pssst: Be sure to share the discount with all the friends in your book club! Lady Thora is a weak, fall-in-line kind of girl. Theodosia is brave and bold, the daughter of the former Queen of Astrea. The Ash Princess is caught somewhere in between the two—inwardly defiant and sure of herself, but with no country or people to rule. The catch? Altogether, they make up just one single person: the fierce and intelligent protagonist of Ash Princess. It all started 10 years ago when Theodosia's country of Astrea was conquered by the Kalovaxians. Soldiers took her land and her castle, and they killed her mother right in front of her. It's a moment that she hasn't forgotten in all her years living as meek Lady Thora in her former stomping grounds. She spends her days with her best friend, Lady Crescentia, pretending to be concerned with balls and tea appointments and the like. But on the inside, she's secretly plotting a way to overthrow Kaiser Corbinian (the new ruler of Astrea) and liberate her people, who are kept as slaves for the Kalovaxian elite. Crescentia, on the other hand, is more concerned with getting the attention of Prinz Søren—the Kaiser's son and heir to the Kalovaxian throne—and has no interest in treason...even if it means saving Thora from the public beatings she endures each and every time an Astrean steps out of line. Things get complicated when Prinz Søren develops an interest in Thora rather than Crescentia...and Thora reciprocates. But it's true what they say: Heavy is the head that wears the crown. Thora's innermost desires go head-to-head with her need to fight back against the Kaiser. She knows she owes it to her country—and to her mother, to her father, to her childhood bestie—to put an end to Kalovaxian rule. The question is: Is she willing to sacrifice love, friendship—and even her life—to do so? Hi book clubbers and happy one year to us! Can you believe we've been reading together for an entire year now? I honestly can't. I'm so glad we're celebrating our anniversary with the incredible Ash Princess. We all know I love an action-packed story... but this page-turner by Laura Sebastian made my heart pound in a completely new way. So, here's the deal: Theodosia has been living under Kalovaxian rule for a decade. She's the daughter of the late Astrean queen (who was actually killed by Theo's best friend's dad...), and made it out of the Kalovaxian siege alive—but her survival hasn't been without consequence. Now, each time an Astrean falls out of line, the Kaiser punishes Theo with a public beating. 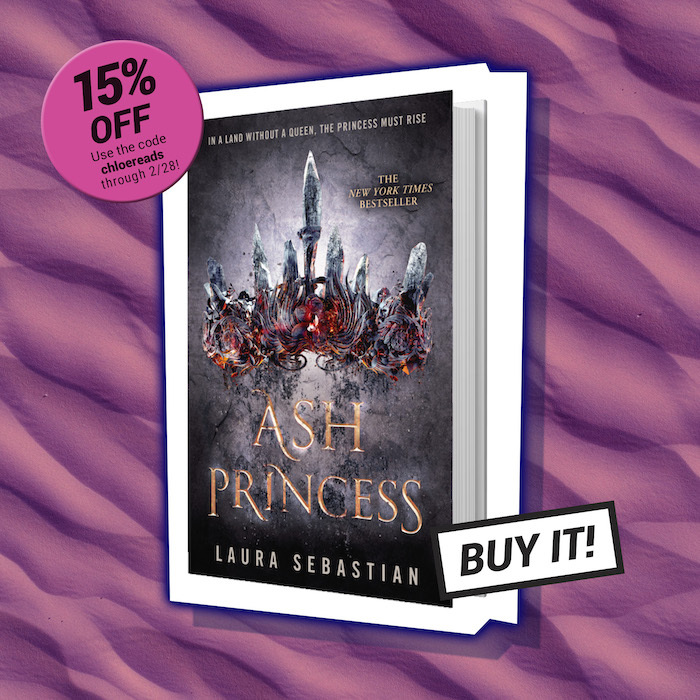 And each time she goes to an event, he forces her to wear a crown made of ash, which instantly crumbles and smudges all over her skin, hair, dress—everything. That way, everyone knows just how strong he is. The crown is meant to say, "Remember when I conquered Astrea? I can do that again." Theo's well aware that the Kaiser holds all of the cards—so she makes herself appear small and weak and does exactly what the Kaiser says. As I was reading (confession time: I read this book in a single day! ), I put myself in Theo's shoes: Would I be able to survive if I were in her position? Could I change myself for others? And then it occurred to me: I *have* done that before. I've obviously never had to endure what Theo has, but most of my life, I've been a people pleaser. I've certainly changed myself in small ways so that others would accept me, and I've tried to be a version of myself that I thought others wanted me to be. Take Dance Moms, for example. One influential figure from the show was not shy about disliking me. She constantly put me down and made be feel like I needed to be more like the other dancers. And, honestly, I could only stay strong for so long until I gave in. I remember thinking, OK, I'm just going to be less like myself to make my life easier. Looking back on that, I feel really sad. Thankfully, I was finally able to break free from that negativity when I left the show...but healing those wounds wasn't an overnight process. It took about two years for me to shake that feeling of inadequacy. But I grew, and I slowly got back to the real me. I guess I'm a bit like Theodosia in that way, too. One of my favorite parts of the whole book was how much she grew from the beginning of the novel to the end. She became stronger each time she stood up for herself and for her people. She was completely inspiring and revelational and, you know, I'd like to think there's a little bit of Theo in all of us. Time to press play! In this mini playlist, we walk you through three tracks inspired by Ash Princess. If these artists existed in the world of Astrea, we'd like to think Theodosia would be rocking a pair of AirPods and blasting the tracks, game face on, as she prepared to take on every Kalovaxian in existence. 1. "Natural" by Imagine Dragons. If Theodosia makes anything clear in Ash Princess, it's that she is, indeed, a natural. She's born (literally) to rule the people of Astrea—and from the very beginning of her harrowing journey, she has her sights set on doing just that and making her mother proud. Her journey's not without heartache, though, just like the song depicts. No spoilers, but this line perfectly describes what she must do to her love interest, Søren, in order to combat the injustices against her people: "That's the price you pay / Leave behind your heartache, cast away." But only time will tell what the future holds for her and Søren (and her other suitors...) after she sets sail. 2. "you should see me in a crown" by Billie Eilish. For years, Theodosia has bided her time. She's bit her tongue during every public lashing. Every pass from Kaiser Corbinian. Every streak left on her skin by the ash crown. But the tables always turn, and now the Kaiser must watch as she makes moves to run this town. One thing's for sure: We can't wait to see Theo in a *real* crown. 3. "...Ready For It?" by Taylor Swift. Taylor might be a dead-ringer for a Kalovaxian (that blonde hair, those baby blues! ), but this song has a vibe so battle-ready that we had to include it. With Laura Sebastian's Lady Smoke just seconds away from being released (get it HERE Feb. 5), the games truly are about to begin. And guess what? Theodosia is more than ready for it. 1. On page 4, it's noted that Kalovaxians have blue eyes, pale skin and light blonde hair while Astreans have tawny skin and dark hair. In this world, the Kalovaxians have conquered the Astreans and are now ruling on their turf. (In fact, Theodosia now lives as a prisoner in the very same castle her mother ruled when she was a child.) Did you notice the racial undertones throughout the novel? Or the similarities between Kalovaxia invading Astrea and actual invasions throughout history? 2. Also on page 4, we learn about spiritgems. They were once sacred and used only by those closest to the gods. There are four different kinds: fire gems, earth gems, air gems and water gems. Each gem possesses different powers: Fire gems give off warmth. Earth gems give the user strength. Air gems give grace. Water gems give you the ability to craft illusions. If you could give one of these gems to someone in your life, who would you give it to and why? 3. On page 42, Theodosia notes how Kalovaxians have been appropriating Astrean culture by dressing in traditional Astrean clothes. Theo remarks, “Astreans aren’t allowed to exist, but their culture is.” Can you think of any instances in today's popular culture where something like this has occurred? Explain. 4. On page 289, Artemisia, an Astrean and one of Theodosia's faux "Shadows," reveals the abuse that she endured while working in the gem mines. What was your reaction to this? Were you surprised to learn that Art had been through something so horrific? What do you make of the actions she took afterward? 5. On page 314, Theodosia and Blaise share a kiss, their second since he's been one of her Shadows. Did this moment catch you off guard or did you see it coming? Are you Team Blaise or Team Søren? Why? 6. Throughout the novel, Crescentia's Astrean slave, Elpis, performs tasks for Theodosia in the name of the rebellion. On page 378, Elpis dies for her actions. However, on page 427, Artemisia notes that Elpis went out as a hero because Theo gave her a chance to fight back, rather than be a victim. Are there any other figures throughout history that have acted similarly to Elpis? Or people who you consider heroes in the same way Elpis is a hero? 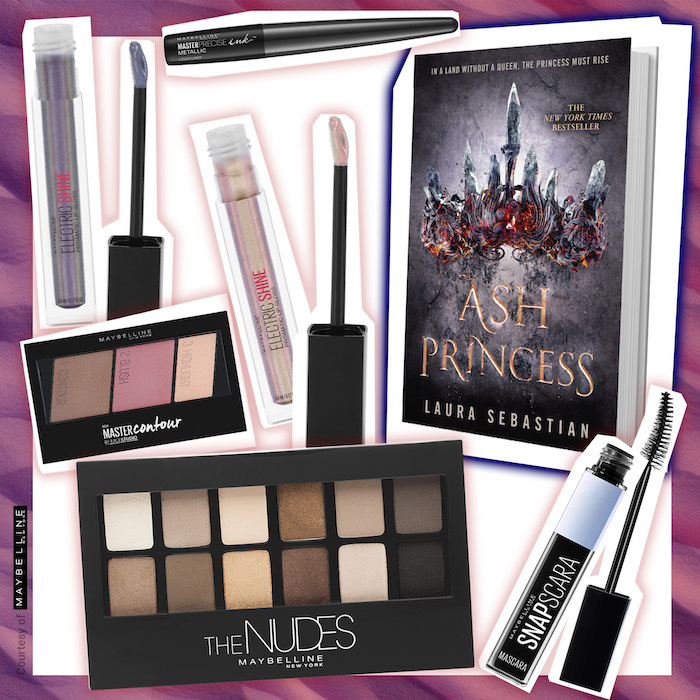 One book-loving babe will win the ultimate Ash Princess prize pack: a copy of the book and its sequel, Lady Smoke, a smoky eyeshadow kit (to #takebacktheash that falls from Theodosia's crown) plus more beauty essentials from Maybelline and a gift card from Barnes & Noble. Ready to enter—and, fingers crossed, win? CLICK HERE to enter! And...that's it! 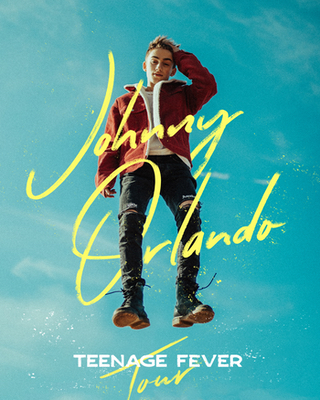 Click HERE to enter the giveaway. Good luck, book clubbers!